Are you looking for Woodpecker Removal in NJ? ALCO Animal & Pest Control offers prompt, professional and safe Woodpecker Removal in NJ since 1995 for many satisfied clients. Whether it is residential or commercial Woodpecker Removal , ALCO Animal & Pest Control will solve your Woodpecker problem in no time. 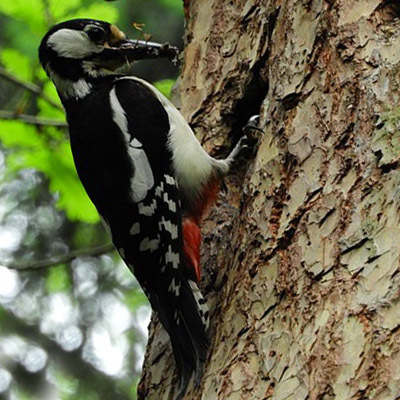 Our trained and experienced Woodpecker Removal technicians are qualified to handle a variety of Woodpecker situations. ALCO Animal & Pest Control will keep you safe and keep you in line with state and local animal laws. ALCO Animal & Pest Control uses environmentally friendly Woodpecker Removal products as well as humane Woodpecker Removal methods to keep you and your children safe while performing the Woodpecker Removal job. Our knowledgeable pest technician will answer any questions you may have and explain to you every detail you need or want to know about the job. We are always friendly and we are here to help you get rid of Woodpeckers. These birds of the order of Piciformes ("a group of birds including the woodpeckers, toucans, barbets, colies, kingfishes, hornbills, and some other related groups"). They are found worldwide and include about 180 species. They got their English name from tapping and pecking noisily on tree trunks with their beaks. This is both a means of communication to signal possession of territory to their rivals, and a method of locating and accessing insect larvae found under the bark or in long winding tunnels in the tree. Some of these birds and wrynecks in the order Piciformes have zygodactyl feet, with two toes pointing forward, and two backward. These feet, though adapted for clinging to a vertical surface, can be used for grasping or perching. Several species have only three toes. The long tongue, in many cases as long as the bird itself, can be darted forward to capture insects. The tongue is not attached to it's head in the same way as it is in most birds, but instead it curls back up around its skull, which allows it to be so long. The bird first locates a tunnel by tapping on the trunk. Once a tunnel is found, it chisels out wood till it makes an opening into the tunnel. Then it worms its tongue into the tunnel to try to locate the grub. The tongue is long and ends in a barb. With its tongue the bird skewers the grub and draws it out of the trunk. They also use their beaks to create larger holes for their nests which are 15-45 cm (6-18 inches) below the opening. These nests are lined only with wood chips and hold 2-8 white eggs laid by the females. Because the nests are out of sight, they are not visible to predators and eggs do not need to be camouflaged. Cavities created by these birds are also reused as nests by other birds, such as grackles, starlings, some ducks and owls, and mammals, such as tree squirrels.